As expected, the Marine Corps has expanded the rules for rating a Purple Heart for Marines who suffered mild traumatic brain injury. Bottom line up front: it used to be a Marine had to lose consciousness to get a Purple Heart for mild TBI. Now, if a medical officer determines that a Marine is “not fit for full duty” after 48-hours from the time of the concussive event, the wound merits a Purple Heart. The new policy became effective April 15, and is retroactive to Sept. 11, 2001. This means thousands of Marines whose medical records show that they meet the new criteria for an event that occurred in battle in Iraq or Afghanistan, can appeal to a Headquarters Marine Corps board to have their case reconsidered for the Purple Heart. 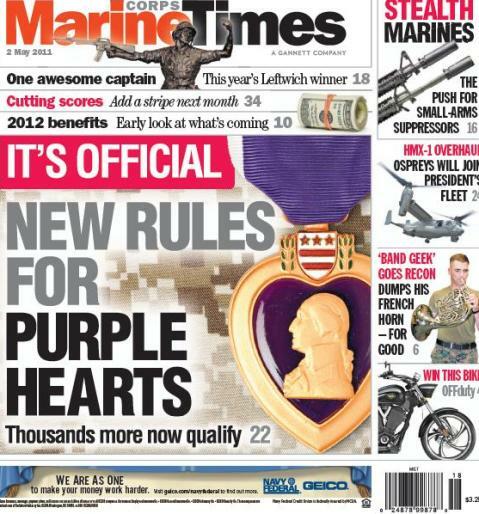 If that’s you or you know someone who might qualify, check it out in this week’s Marine Corps Times. I received a grade 2 concussion from an IED blast while on a sniper op in Afghanistan back in January. I was placed on 7 days of light duty and was not allowed to leave the wire for any reason. I am not sure if this rates. Does anyone have any idea? The way it reads as long as It’s documented that 48 hours after it happened you were off full duty you should rate. My brother was is a Marine, and he was hit with a steal I beam in the head and was knocked unconscious. He had to serve light duty for a period of time, I don’t know the exact details. How would I find out if he qualified?